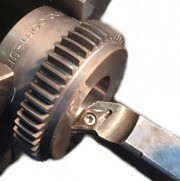 Naismith Engineering can bore and key our full range of pulleys, sprockets and couplings to suit your applications. We have an extensive range of broach sets to accommodate a variety of standard and non-standard keyways. Bore sizes from as small as 6mm up to 230mm with a 50mm key are possible. We can bore to very close tolerances for bearings, and supply with circlip groves if needed. We can taper turn to suit standard Taper Lock bushes and QD bushes. Our CNC drilling facility enables us to provide very accurate drilled and tapped holes on a nominated PCD. Our welding workshop can weld in ex-stock blank bosses and taper lock Weld-On hubs.